A film’s originality is always a bonus. In this case director Drew Pearce’s bizarre yet crazy action thriller Hotel Artemis set in Los Angeles in 2028 is a stark reminder of how chaotic a world can become when law and order breaks down and climate change ravages a city. A Multi-National Corporation has control of downtown L. A.’s water supply and riots have ensued. In the midst of this anarchy, two brothers codenamed Waikiki and played by Sterling K. Brown and Honolulu played by Brian Tyree Henry get injured in a bank robbery as well as steal some precious diamonds from the Wolf King of L. A. a crime overlord played by Jeff Goldblum. The only refuge the wounded brothers can find is at Hotel Artemis run by the Nurse, an embittered, heavy drinking nurse, superbly played against type by double Oscar winner Jodie Foster (The Silence of the Lambs, The Accused). Hotel Artemis set in downtown L. A. is a Hospital for gangsters and has amongst its guests a lethal assassin codenamed Nice played by Algerian actress Sofia Boutella and a cocaine sniffing arms dealer codenamed Acapulco played by Charlie Day (Pacific Rim, Horrible Bosses). Written and directed by Drew Pearce, who cleverly makes full use of his diverse cast and wisely gives sufficient screen time for Jodie Foster who really holds Hotel Artemis together as the Nurse who suffers from agoraphobia and alcoholism whilst coming to terms with the demons in her own past, namely the death of her son from a drug overdose. Action man Dave Bautista (Guardians of the Galaxy) plays Everest, the Nurse’s able bodied assistant, while Zachary Quinto plays The Wolf King’s son and heavy weight gangster Crosby Franklin, who breaches the criminal hotel. While Pearce devotes the first half of Hotel Artemis to building up the characters and creating the chaotic atmosphere, he wastes no time in the second half with action, as each prisoner/guest turns on each and The Nurse realizes that her best hope for survival in this ruthless criminal underworld is by escaping it. Despite its originality, Hotel Artemis gets a film rating of 7 out of 10. I felt that writer/director Drew Pearce needed to spend sufficient time fleshing out the backstory to make the ending more palatable. 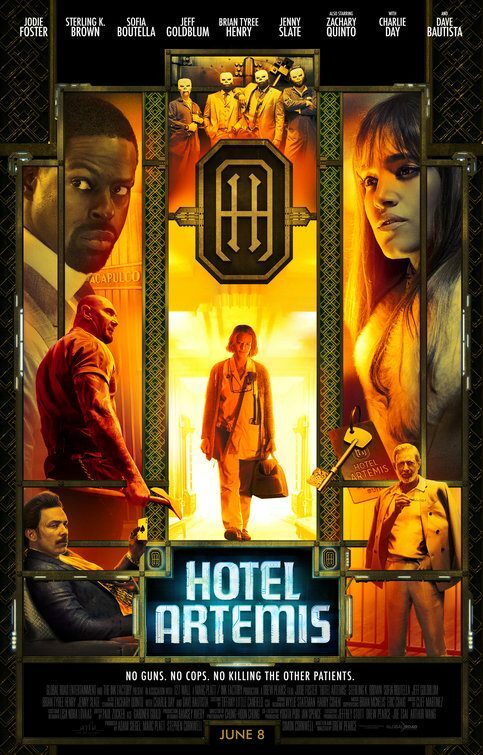 Audiences that enjoyed Blade Runner 2049, will enjoy Hotel Artemis, a dystopian action thriller without the replicants and sophisticated imagery.